Firefield night vision binoculars are all generation 1 and range in objective size from 24mm to 42mm, and are 2 or 3 power. 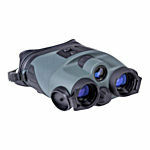 Firefield Gen 1 night vision binoculars currently consists of three models: Tracker 2x24, Tracker 2x24 waterproof, and Tracker 3x42. Each has a built-in infrared illuminator.